PrinterTechs metal-sleeved HP Laserjet 4200 fusers are a tremendous improvement over the original HP plastic sleeve design. Our fusers virtually eliminate the tearing problem inherent in these fusers -- see image below. With our metal sleeved fuser and metal swing plate gear, the LaserJet 4200 becomes an extremely reliable workhorse printer. Fusers are available on exchange, see exchange terms in the yellow box below. Maintenance Kit - exchange. PrinterTechs compatible fuser - metal sleeve, for Laserjet 4200. Maintenance Kit - no exchange. 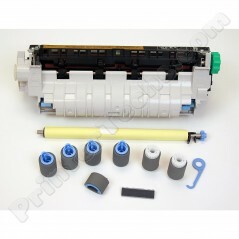 PrinterTechs compatible fuser - metal sleeve, for Laserjet 4200. Maintenance Kit - exchange. New HP fuser - metal sleeve, for Laserjet 4200. Maintenance Kit - no exchange. 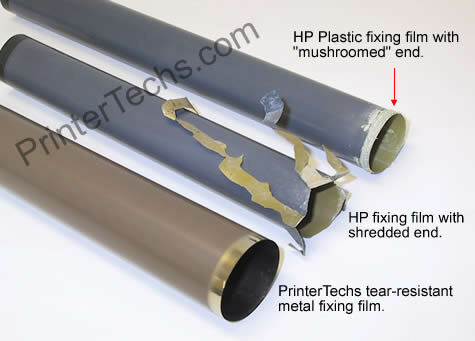 HP new fuser - metal sleeve, for Laserjet 4200. The absolute best HP 4200 fuser you can buy!! Why would you keep replacing your HP 4200 fuser with one that uses a plastic sleeve prone to tearing? Yes, you can find 4200 fusers for $60 - $70 but how long will they last? Will the sleeve tear in 6 months, 9 months? You don't know. Then you'll have to buy another one, and another, and another. Buy a PrinterTechs(TM) 4200 fuser upgraded with the newer metal sleeve technology and save yourself future grief. For those who don't know, the LaserJet 4200 fuser is notorious for shredding its sleeve (fixing film). New and remanufactured HP 4200 fusers contain a plastic sleeve prone to the tearing and shredding. Most of the printer industry has resigned to accepting the higher failure rate (hey, they sell more fusers if they fail more often!). This was not acceptable to us so 10 years ago we set out to find a solution to the problem. We tested many different fixing films, pressure rollers, flanges, high-temperature greases, solid film lubricants, heating element coatings, and other parts, but we didn't stop we had the right combination of parts to make this an extremely reliable and thoroughly field tested fuser. We don't know of any company with more experience using metal sleeves in a 4200 fuser. Our current long-life metal fixing film is far more robust than the plastic fixing film HP uses and eliminates the grey scale ghosting found in new HP 4200 fusers. These fusers are 100% compatible with all LaserJet 4200 printers. Our current version of this fuser uses our long-life fuser sleeve and grease that we have tested to over 500,000 pages! Try that with a cheap fuser!